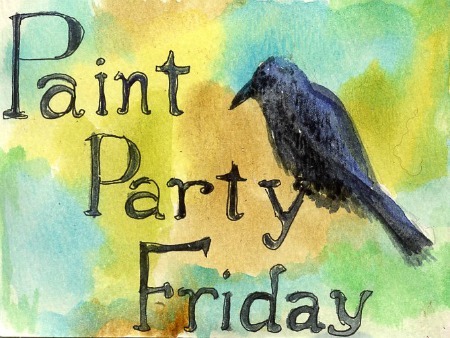 Welcome to Week 20 of Paint Party Friday (Year 2) and to the next edition of our Featured Artist Series! (Would you like to be a PPF Featured Artist? Please click here for details!) 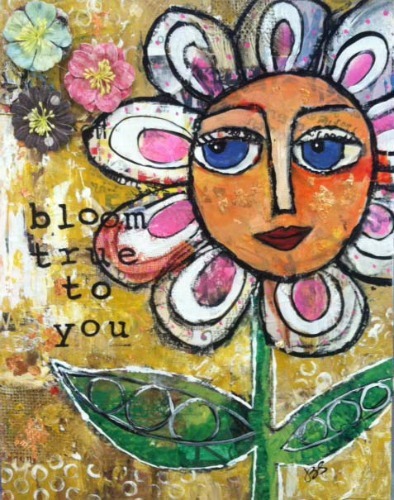 This week's featured artist provides inspiration by combining mixed media with meaningful messages. Please welcome Jessica Sporn! I've been drawing and painting for as long as I can remember. But I never thought I'd make a living from it! I always wanted to be an actress, and went to the "Fame" school in New York City, the High School of Performing Arts. After college, I performed here and there in the city, but then decided I wanted to change the world. So I went to law school and practiced law for 7 years. When I was pregnant with my first child, I painted her birth announcement. While I was home on maternity leave, a friend asked me to paint a mural on her child's wall in the style of the announcement. Then a friend of her's asked me to do that as well. I thought - here's a new career! And since I couldn't bear to leave my daughter for what had been a 60 hour a week workweek, I started painting murals and other decorative painting techniques. One thing led to another, and I stumbled upon the world of art licensing. 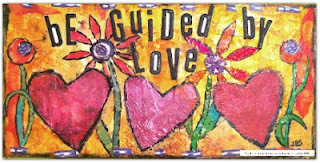 I was lucky to find a relationship with Recycled Paper Greetings, and also with my agent, Creative Connections. When I first started illustrating, I mainly used watercolor and gouache. My style was very controlled -- I drew everything out in pencil and then painted in the lines. 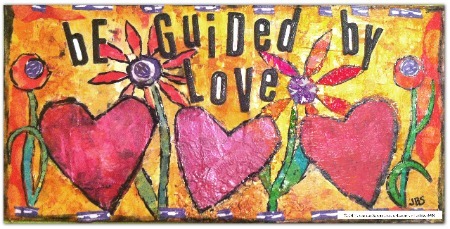 As the years have passed, I have experimented with different mediums and materials and grown freer. Now, I strive to color outside the line! 2. What are your favorite techniques, media, and tools to use in creating your paintings? 3. What is your favorite thing to paint? Why? Probably flowers are my favorite thing to paint. I am an avid gardener and nature never ceases to astound me. 4. What is your proudest painting moment and/or greatest painting achievement so far? I have a few... One was having one of the menorah's I designed featured in the New York Times. 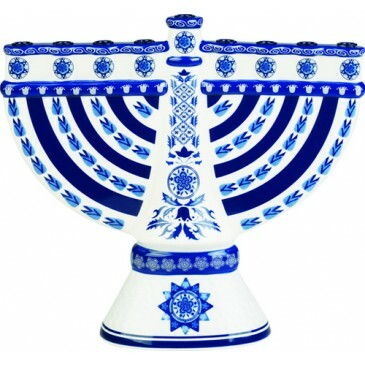 (You can read about it here, and here's the menorah.) Another was designing a tableware collection based on the "Woman of Valor," from Proverbs (You can see the collection here). And finally, having Amazon.com describe me as "famous artist Jessica Sporn" in the description for this whimsical menorah definitely made me smile! 5. What's next in your painting future? I am excited to say that I have recently been asked to join a design team. I can't say which one, but I'll be able to share in September. I am currently working on a new Passover line for Aviv Judaica, and continue with my licensing work. 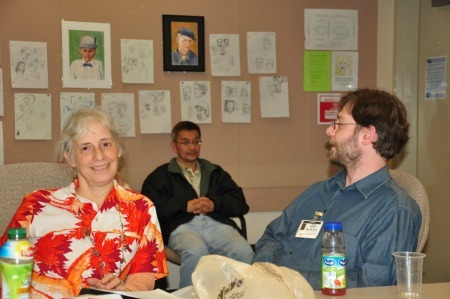 I am excited to have attended CREATE New Jersey, where I learned new skills and techniques. I've also been asked to teach an art journaling class at a local crafting store, which will start in September. Have a wonderfully fun and creative week everyone! 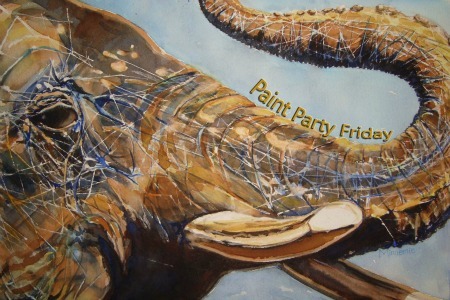 Welcome to Week 19 of Paint Party Friday (Year 2) and to the next edition of our Featured Artist Series! (Would you like to be a PPF Featured Artist? Please click here for details!) 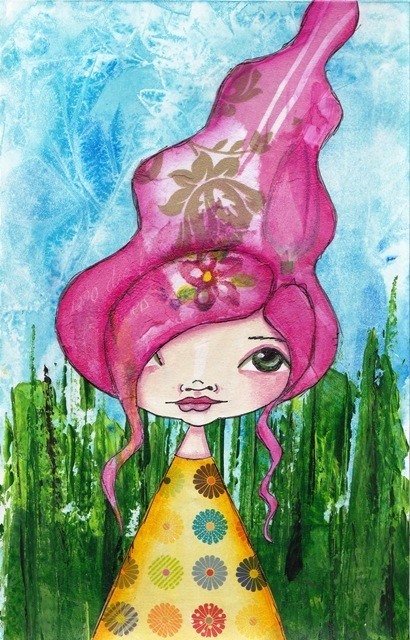 This week's featured artist has been sharing her lovely ladies with us from the beginning of PPF, she is also the creator of Cotton Candy Girls. Please welcome Natasha May! 1. Please tell us a bit about your personal history with painting. (When did you start painting? How has your painting evolved since you first started?) My painting history is probably very similar to most of you here on Paint Party Friday. :) I was told I draw very nicely when I was little but was never encouraged to develop my skills any further than that. So I procrastinated to my adulthood and about 4 years ago finally found the courage to start playing with paint again. I like to think my painting style evolved from my beginnings. :) When I look at my first paintings I remember being so excited about all these new techniques I was learning through on-line classes. I like to believe that through the years I found my own style and my own way of painting that is comfortable to me. 3. What is your favorite thing to paint? Why? My favorite thing to paint are pretty girl's faces. :) It's hard to say why but it's something I enjoy doing. 4. What is your proudest painting moment and/or greatest painting achievement so far? My proudest moment is my on-line workshop. :) I finally spread my wings and took a leap. It was a hard decision because of all the "you're not good enough" voices in my head but I found the courage to do it anyway. 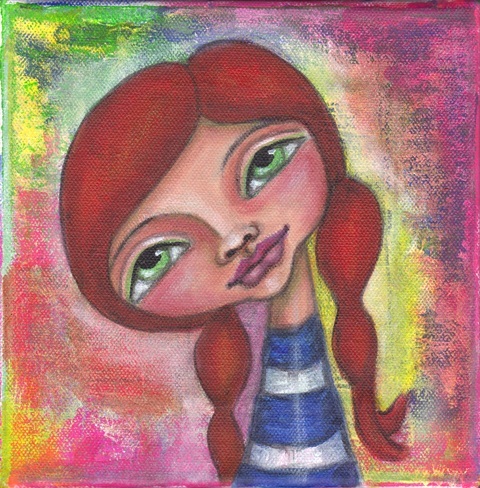 Have a creative and painting filled week everyone! 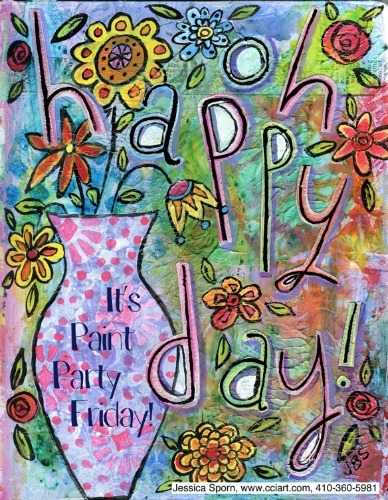 Welcome to Week 18 of Paint Party Friday (Year 2) and to the next edition of our Featured Artist Series! (Would you like to be a PPF Featured Artist? Please click here for details!) 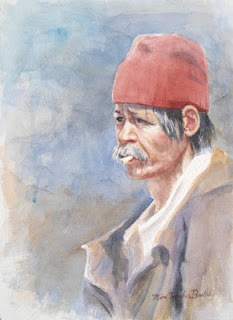 This week's featured artist works wonders with watercolors. Please welcome Mimi Torchia Boothby! 1) Please tell us a bit about your personal history with painting. (When did you start painting? How has your painting evolved since you first started?) I have been drawing and sketching for most of my life, but in 2006 I picked up a paintbrush at the Daniel Smith Art supply store near my house. There was a demo there with their paints, brushes, and paper, so all you had to do was dip the brush in. I filled the brush with paint and swirled it around on the paper. That was all it took. I went home and dug out old supplies and started painting and haven’t stopped yet. I learned technique slowly and discovered that better brushes and paper make all the difference in the world with watercolor. Those two things made me hate watercolor and give up before. You need to use good materials, it’s a must. 2) What are your favorite techniques, media, and tools to use in creating your paintings? My favorite medium is watercolor of course. I have about 5 brushes that I cannot live without. Those are my favorite tools. I need a HB pencil, lots of erasers, and a number 2 pencil as well. And my Daniel Smith Paints! I do use about 3 colors from Windsor Newton as well. They are: raw umber, cobalt turquoise, and raw sienna. Daniel Smith has colors with those names, but they are different. 3) What is your favorite thing to paint? Why? I love painting portraits, but I find that painting the faces of cats and dogs is equally fun. I am not sure what it is about portraits that is so pleasurable. I end up studying the person (or pet) and learn things about them that maybe their family has never noticed. It’s a very intimate connection. I have painted deceased family members and it’s just like having a visit! Another really awesome experience I had was my recent retirement party at work. We hung up all the sketches (doodles done while I sat in meetings) I’d done of my coworkers over the years. There were over 70 separate pages, each usually with several sketches on the page. After the party, my coworkers all came around and picked their favorites and took them home. 5) What's next in your painting future? Now that I am retired, I hope to paint portraits of a few more of my neighbors and enter more competitions. I have not had much time to focus on the marketing aspect of my work up until now. I do sell paintings right off my blog and also from facebook. 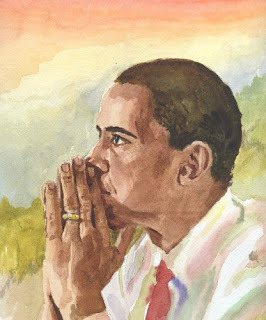 I have an account at Fine Arts America, but it doesn’t perform as well as facebook does. 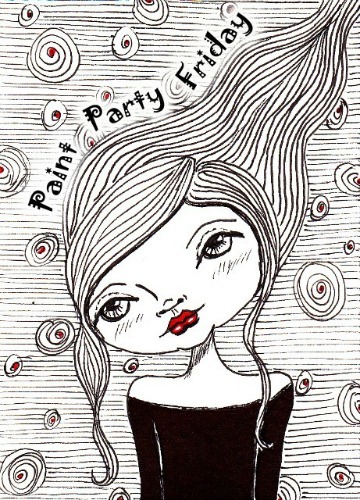 Welcome to Week 17 of Paint Party Friday (Year 2) and to the next edition of our Featured Artist Series! (Would you like to be a PPF Featured Artist? Please click here for details!) This week's featured artist wows us with her wonderful watercolors weekly. Please welcome Minnemie Murphy! 1) Please tell us a bit about your personal history with painting. (When did you start painting? How has your painting evolved since you first started?) I started painting 3 1/2 years ago, when my friend Uschi invited me to join her in a watercolor class. She suggested that it would be a great sanity-break for me. (My house vibrates with the footsteps and voices of 5 lovely, lively little boys.) I have to be honest, however, that I was not really all that interested in watercolor as a medium, and had little hope for gaining much from the class artistically. (While I have always had a burning desire to create, and an irresistible attraction to colors, brushes and pencils, I had not been able to be creative in a satisfying manner. After a couple of disappointing drawing classes, I figured that I just didn't have what it takes to do the artist-thing.) But I really wanted to get out of the house, so I joined Uschi for this watercolor class. After all the supplies were purchased, I thought it to be a rather expensive investment to collect dust after the 10-week class… for that is what I was sure would happen. But I am happy to report that I was wrong! Our instructor, Tom Herzog, turned out to be fabulously talented and creative, but also exceptionally patient and encouraging. Through his guidance I discovered that I do actually have a Right-Brain, and that my (very helpful in many other areas of life) Left-Brain needs to be silenced while I create. Oh JOY! I found a part of me that I've always been looking for! I do not know how much (or even if) my work has evolved since I started... I still stick pretty much to technique and realism. I know though how I would like for my work to evolve: I would like to be able to paint more loosely - more right brain-led than left brain-limited. 2) What are your favorite techniques, media, and tools to use in creating your paintings? 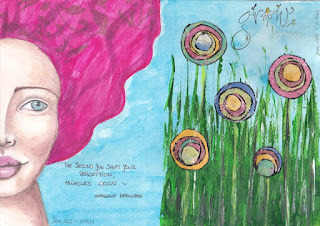 I mostly paint with watercolor, since it is the medium that unlocked my creative journey. I also like it because it responds well to simple household items and techniques such as throwing salt, applying gauze, dripping rubbing alcohol, blowing with a straw... and frisket. Not a household item, but I can't live without frisket. And since time and space is often limited in a house with a tribe of little hurricanes running around (yes, I do tell them not to run in the house but...), I vote watercolor for its simplicity in setting-up and cleaning-up. I have played with acrylics a few times and find it to be much more forgiving than watercolor, but ironically also more frustrating, for I really do not know what I am doing! (Yes, Mrs. Left Brain Perfection interfering again. She needs the rules in order to function comfortably! But I do think there is something valuable in knowing the basics…) Lately I started sketching in a journal regularly, for it is an easy way to ensure daily creativity on those crazy laundry-monster and brotherly-love/war days. I have also heard it said that a painting is only as good as the sketch, so I figure this is an important habit to nurture and skill to improve. 3) What is your favorite thing to paint? Why? 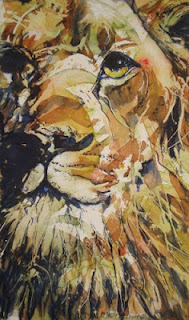 I love painting African animals. I grew up in South Africa, but I did not realize how deeply the soil, and the feet (or hooves) that tread it, was part of my heart until I left my home country. 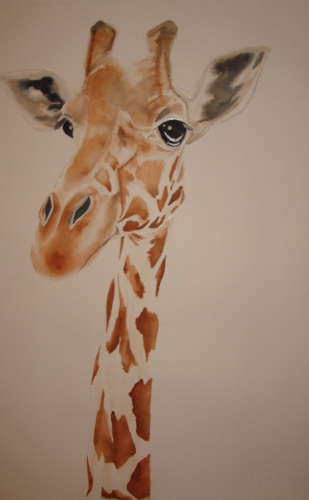 Maybe it is not coincidence then that my first "successful" painting was a giraffe. From there on I found myself painting the African creatures very often. 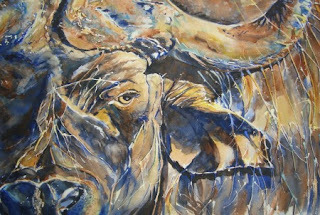 Elephants have been my favorite since childhood, and they also turn out to be great fun to paint! The painting that the The Tribe likes best is one that just kind of happened one afternoon - without much planning or aspiration for a successful outcome. (Mrs. Perfection was out on an errand I believe... :-) ) It is titled "Not Safe... but Good" - a description of C.S. Lewis' Aslan - an important and beloved character in our home. Have a funtabulous and creative week, everyone!